What made you want to join the Gazette staff? I’ve found the East Kingdom Gazette rather helpful in finding things out sometimes, and I thought it likely that the Æthelmearc version would be even better! I also enjoy editing, and have been working with WordPress a bit in other areas, so it felt like something I could do. What do you like most about being on the Gazette staff? I like seeing what other people are writing and knowing what’s going on in the Kingdom and the Known World. The other editors are really great people, and I like being involved in something for and about our Kingdom. 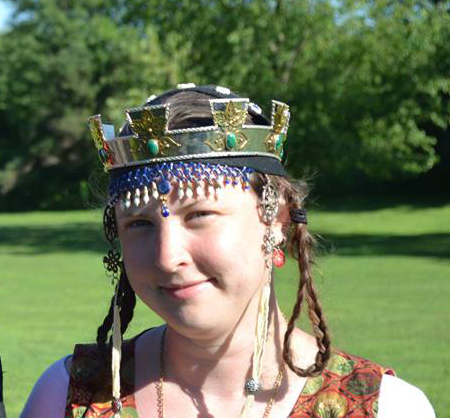 At various points I’ve been a Chatelaine, and what I love about that is introducing the SCA to people, so it’s fun to be involved in something that promotes and connects the Society. How has the Gazette been received in your area? I believe it’s been received well. It’s a helpful resource, and people enjoy reading about the different things happening in our Kingdom, and in the Society at large. What kinds of articles would you like to encourage people to submit? My favorites to read have been those which give a background or a more in-depth look at things we might otherwise gloss over or assume we know everything about. I would love to see more of those. I think we have a tendency to find our niche and stick to it, and that’s great for learning a lot about one area, but I appreciate finding ways to expand and make connections to other parts of the Society. There are often hidden wonders in other areas that we might otherwise not explore. Interested in submitting articles to the Gazette, suggesting blogs to feature, or to be put on our roster of photographers whose work we have permission to use? Email us at aethgazette@gmail.com. Check out our submission guidelines here.